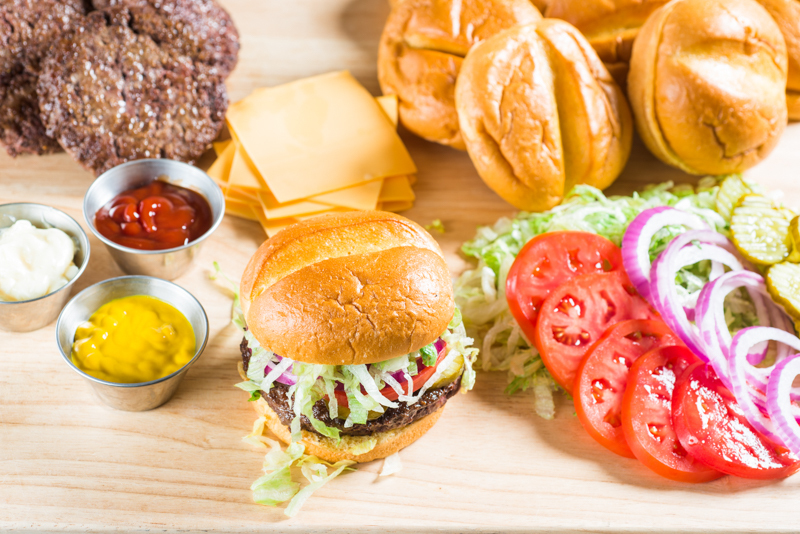 Our USDA Choice burgers plus the following toppings: shredded lettuce, sliced tomatoes, American cheese, red onions, mustard, ketchup, mayonnaise, and pickles. *These menu items are cooked to order. NOTICE: Consuming raw or undercooked meats, poultry, seafood, shellfish, or eggs may increase your risk of food-borne illness, especially if you have certain medical conditions. Our Burger Bar gets even better with USDA Prime burgers, cheddar and Swiss cheeses, sautéed baby 'bella mushrooms, grilled peppers and onions, bacon, and barbecue sauce.